Set Up: 16 players - 4 groups of 4 players are organised inside 12 x 12 yard grids as shown below. 1 ball per group. 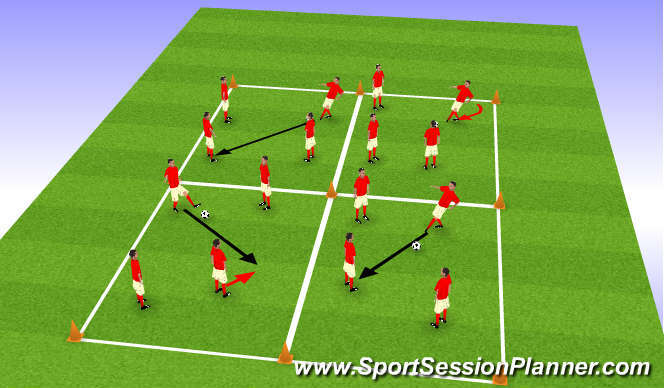 Players move freely passing the ball using 1 or 2-touch play. Players are encouraged to pass the way they are facing to increase the tempo of the exercise. A ball is rolled into area to start the exercise. Two defenders (yellow) run into the grid and attempt to steal the ball. 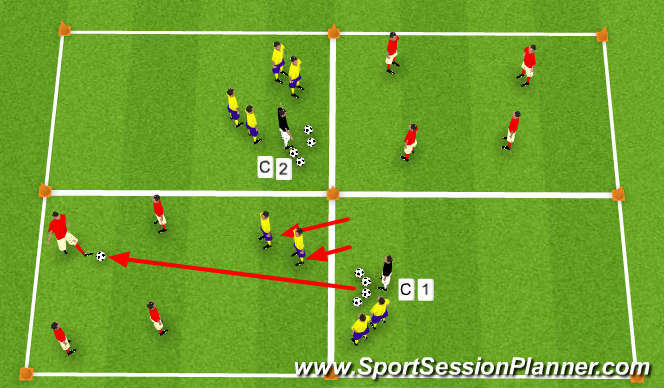 When defender steals ball they must run back and tag hands of next 2 defenders: new ball is served to repeat the sequence with the other two defenders.A total of 4 balls are passed into the grid - teams switch roles after the fourth ball. Team that executes the greatest number of passes for the 4 balls wins the game. -A 3v3 + 2 neutral (white) players is organised inside a 15 x 20 yard grid as shown. Two grids are organised to accomodate the entire team (NOTE: only one grid is illustrated) A supply of balls should be placed around the perimeter of the playing area to keep the flow of the activity. Players attempt to maintain possession through sharp passing and movement. Players can pass to the "neutral" players on the outside of the grids - neutral players are limited to 1 or 2-touch (depending on ability). 7 consecutive passes = 1 point. -A 3v3 + 2 neutral (white) players is organised inside a 15 x 20 yard grid as shown. Two grids are organised to accomodate the entire team (NOTE: only one grid is illustrated) A supply of balls should be placed around the perimeter of the playing area to keep the flow of the activity. 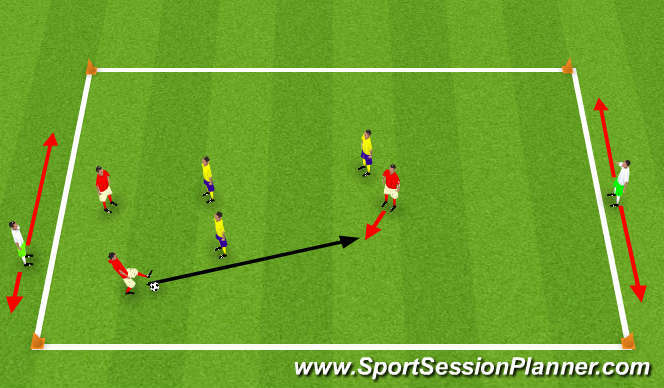 Players attempt to maintain possession through sharp passing and movement. Players can pass to the "neutral" players on the outside of the grids - neutral players are limited to 1 or 2-touch (depending on ability). 7 consecutive passes = 1 point. Set Up: A 4v4 + goalkeepers is organised on a 40 x 20 yard playing area as shown. NOTE: Two additional teams of 4 players perform light technical work with the assistant coach as recovery between games of 4v4. 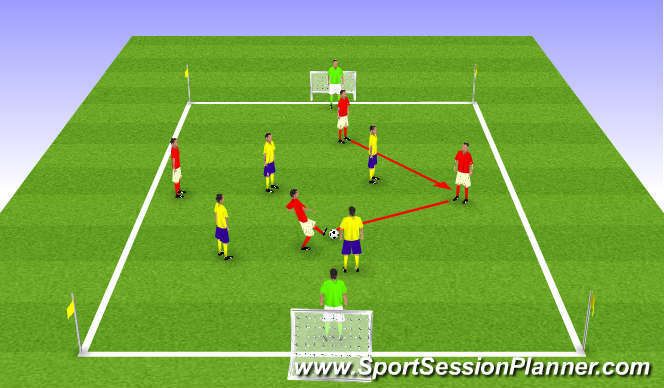 Set Up: An 8v8 + goalkeepers is organised as shown above.